At the beginning of World War II, Britain needed to increase home food production, and the area of land under cultivation was rapidly increased. County War Agricultural Executive Committees, and district committees under them had exceptional powers to determine the direction of farming at a local level. Between June 1940 and early 1941 some 85% of the agricultural area was surveyed. The individual farm records form the record series MAF 32 in The National Archives. Every farm and holding of five acres was surveyed and classified according to the physical condition of the land. Conditions of tenure and occupation, statistics of crop acreages, livestock numbers, the number of workers, mechanical equipment, and rent and length of occupancy were all recorded either by the farmer of forms provided, or by inspectors. The table shows information compiled from MAF 32 for 3 Deal farms. For comparisons of farm holdings see Farming in Upper Deal 1843-1941. 1941-10-08 Court Lodge Mount Bros MAF 32/1022/394/2 127a under crops and grass, 34a vegetables and small fruit, including land in Sholden. 107 pigs, 98 poultry, 5 horses, 15 cattle.1 engine, 2 tractors. Employed up to 13 workers. Rated A. Occupied 22 years. Rent £299. During WW2, Mount Bros also ploughed 11a of the playing fields at Victoria Park owned by Deal Corporation. 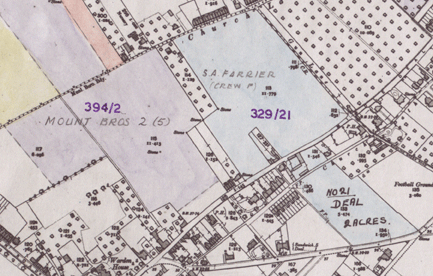 Maps in the series MAF 73 were drawn to serve as a graphical index to the farm records. Ordnance Survey maps on varying scales and dates were used, and marked up showing the farm boundaries and the fields in it. The example shows part of Upper Deal. National Farm Surveys of England and Wales 1940-1943. The National Archives, retrieved 2010-11-25. Maps for Family and Local History. Geraldine Beech and Rose Mitchell, 2004 contains a chapter on the farm survey.